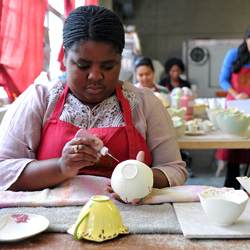 Huge capital outlay and associated labour costs are just two of the biggest barriers to establishing a ceramic manufacturing business in South Africa. Adding to this challenge is the growing influx of cheap imported Chinese ceramic products which in effect shuts prospects for a new entrant looking to break into this industry. So what would compel a woman with absolutely no experience or entrepreneurial background to venture into this competitive and largely male dominated terrain? “It’s about identifying a gap in existing products; you then create that missing product and position it to a particular target market,” says Kate Carlyle. Carlyle is the founder and managing member of Mustard & Moonshine (M&M)-100% women owned Western Cape based ceramic business specialising in producing functional art. For, Carlyle, the decision to establish a business in functional art as opposed to the more traditional ceramics such as tiles, toilet sinks and bathtubs among others was easy. “It would be suicidal for an entrant in this business to focus on producing traditional ceramics because of the influx of such cheap imported products. In any case, Chinese manufacture these products at a fraction of our cost base because labour costs-which constitute a large portion of operational costs in China are quiet minimal,” she says. Since establishing M&M in 2002, the company’s product range has become popular in the more wealth European, US and Brazilian markets-which explains why the export market accounts for about 90% of the company’s revenue. Yet, uptake to functional art in the local market has been dismal-a factor she attributes to the widening gulf in the incomes of local clients compared to those in the overseas market. Despite, Carlyle’s bullish sentiment, prognosis is that SA’s ceramic industry is in fact trapped in a downward spiral. She agrees but argues that her company’s minimal exposure to the local market has helped to steady M&M’s revenue momentum. In 2008-during the peak of the recession-M&M was hit by a double whammy resulting from a considerably huge downturn in sales volumes over two years coupled with pricing pressures and erratic order placements. Post IDC funding, M&M has re-discovered its growth path. And the timing of this recovery could not better. The improving economic outlook in the overseas markets is having a positive knock-on effect on its order book. Sales have increased, larger orders are being placed; even better SA based clients are now requesting for credit facilities to fund their purchases. For example, the Women Entrepreneurial Fund (WEF) provides funding to women shareholder/s only where they own 25% plus one share in a business or to a business as a whole where women shareholding is 50% plus one share. Women across the race spectrum can access WEF as long as they meet the DFD’s lending criteria.